(Bloomberg) -- The United Nations’ tribunal for atrocities committed during the bloody breakup of Yugoslavia confirmed convictions of genocide and war crimes against Bosnian Serb leader Radovan Karadzic and extended his initial sentence to life in prison. Vagn Joensen, the presiding judge of the Appeals Chamber in the Hague, Netherlands, said an earlier prison term of 40 years handed down in 2016 "underestimates the extraordinary gravity of Karadzic’s responsibility and his integral participation" in the crimes and was "unreasonable and plainly unjust". 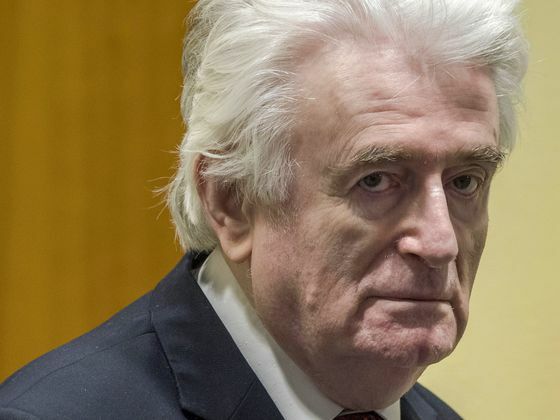 In that ruling, Karadzic was found guilty of genocide and nine other counts of war crimes and crimes against humanity for his actions in the war in Bosnia and Herzegovina. "The 40‐year sentence inadequately reflects the extraordinary gravity of Karadzic’s crimes," the court said in a summary of the judgement. It said it came to its conclusion after comparing the terms to those of Bosnian Serbs who served under Karadzic. Karadzic, one of the tribunal’s most high-profile targets along with his military commander Ratko Mladic and the late Serbian strongman Slobodan Milosevic, appealed the initial verdict, along with prosecutors. He sought to overturn it, while the prosecutors demanded a life sentence and guilty verdict on more counts for which he was acquitted. The bloody disintegration of Yugoslavia -- Europe’s most violent conflict since World War II -- killed more than 100,000 people in Bosnia, the former federation’s most ethnically diverse state. Karadzic, 73, led ethnic Serbs who took up arms in 1992 when the republic’s two other ethnic groups, the Muslims and Croats, moved to secede from Yugoslavia. Under his leadership, Serbs carved out their own mini-state, with the support of neighboring Serbia and Milosevic, who died in 2006 awaiting a verdict. Bosnia’s three-way ethnic feud led to a land grab between the rival groups and the expulsions of entire communities that displaced half of Bosnia’s pre-war population of 4.4 million. Serbs seized around 70 percent of Bosnia, then settled for 49 percent under the 1995, U.S.-mediated Dayton peace accord that left Bosnia semi-divided into two autonomous entities, the Serb-run Republika Srpska and the so-called Federation for Muslims and Croats. A weak central government and a three-member presidency are meant to hold the country together but are often dysfunctional. Indicted by the international court in 1995, Karadzic stepped down after the war and went into hiding. He was caught in 2008, in Serbia, where he had grown long gray hair and a bushy beard and was living under a false identity as a homeopathic healer. Before the war, he was a psychiatrist and an amateur poet. His trial before The Hague, Netherlands-based court opened in 2009, with almost 600 witnesses appearing over 497 days of testimony. Karadzic insisted that late U.S. diplomat Richard Holbrooke, who mediated the Dayton pact, promised to him he wouldn’t be prosecuted if he left public life. Karadzic’s military commander Ratko Mladic, was sentenced to life in jail in 2017 on similar charges. He also appealed his verdict.